Villa fans could afford themselves the luxury of kicking back and watching Match of the Day this weekend as Aston Villa secured a massive three points against Cardiff. The win also put an end to an ugly four game drought as Leandro Bacuna and Libor Kozák netted for the Villans. You would be forgiven for watching Match of the Day with a cigar and a brandy in fact as this is the first time that Villa have not been fighting in or around the relegation places for a long while. Here’s what we learnt this week as Villa fans…..
One thing that has been taken for granted this season is the inclusion of Ciaran Clark and Nathan Baker in the first team. Clean sheets against Norwich, Hull, West Ham and Cardiff are testament to the fact that the youngsters are making far fewer mistakes. They can still improve, obviously, but they have importantly earned the trust of the fans. Worth mentioning are Ciaran Clark’s two excellent crosses against Cardiff this weekend. They were perhaps the two best crosses I have seen from a Villa player this season! This was the name Paul Lambert gave Leo Bacuna this summer, and boy did he live up to his name against Cardiff. In fact, he probably should be called Leo the Lion. 75 minutes gone at Villa Park, edgy crowd, seven hours without a goal – who do you call? The kid is simply brilliant from dead ball situations. If there is a free kick or corner for your team you’d be confident that Bacuna could whizz the ball into the area and hit his target. In respect of lethal Leo’s set piece delivery, is it time to move aside on corners, Mr. Westwood? Arsenal scouts were at the match on Saturday and Jose Mourinho is travelling to watch Belgium play Colombia on Thursday. Many of the daily newspapers are claiming that this trip is to watch Falcao, but I’m not so sure. Jose was briefing his associates in the summer that he liked Benteke and wanted a new striker to lead the line. It may be that Jose has since changed his mind on Falcao (who he earlier discounted), but I suspect he’s going there to watch how Benteke and Lukaku play up front together. If there are bids in January, Randy Lerner should accept no less than £40m. I remember some fans were claiming after Hull that Kozák’s aerial ability was ‘not his game’. Kozák proved that he can win important headers for Villa this weekend with his late headed goal against Cardiff. Kozák won 4 out of 11 aerial duels on Saturday and can improve a lot, but his passing game was better than in previous matches with a 75% pass success rate. Paul Lambert said this week that some of the new players had improved since they arrived at Bodymoor Heath, and you suspect he had the big Czech striker in mind when he made his comments. Paul Lambert mentioned the nervous crowd in his post match comments and you had the feeling he was a little irked by the booing at half-time. Lambert isn’t the only manager to complain about his home fans this week, but do we need to be more noisy and passionate, Villa fans? Or is it acceptable to boo at half-time? the performances against hull, west ham and first 45 vs Cardiff were horrendous! I think those 2 goals have papered over the cracks that our football has got considerably worse since the end of last season/start of this. maybe a lot more of training is going into defending than play after last year?? Apart from decent counter-attacking displays against the top teams, the overall performance levels haven’t been that great. For example, the first half against Man City, Villa were on the ropes getting pummeled. Even against Arsenal, if Arsenal had taken their chances for 2-0, it would have been game over. Against Hull & West Ham, they lacked ideas and vs Cardiff, it was pretty uninspiring until Bacuna stepped up. Still, in terms of results in all these games mentioned, Villa pulled it out of the bag. I just don’t like teams like Liverpool, Spurs, Everton and Newcastle walking away from Villa Park with three points. One out of four, you could handle, but not all of them! 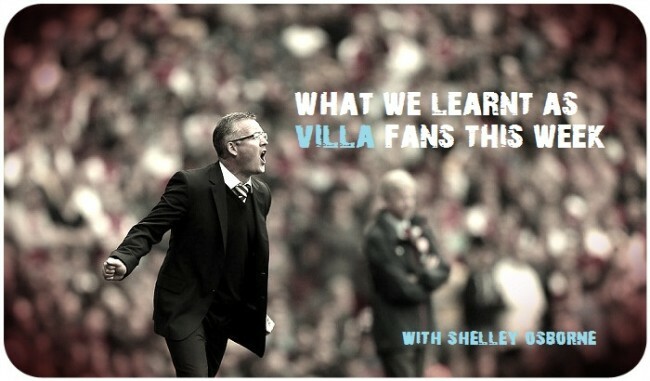 We need to get our respect back quick in terms of Villa Park. I don’t think the boos at half-time were warrantied. Granted, we hadn’t scored and may not have been happy, but the boys had created a few chances and were at least trying for a breakthrough.